Absolutely amazing. Hezi is an incredible instructor, and the "Handgun Seminar - Beginner" training is perfect for both brand new shooters and experienced alike. He walks you through gun and shooting safety, and drills home the basics before you go to the range. This is an outdoor range with no bench/obstructions: you learn to shoot standing, kneeling, and (if time and talent permit) while moving. This is not sport shooting; this is DEFENSIVE shooting taught by a former Israeli Defence Force (IDF) member. Highly, highly recommended! Shooting with Hezi was a great experience! Prior to this I had minimal shooting practice. I had gone to the range once and shot 357 and 22 handguns. Hezi taught us basic gun safety, assuming a proper shooting stance, racking the gun, and then shooting both in place and while advancing. My husband was looking forward to shooting his rifle and shotgun--and when it happened, he got a "kick" out of them. In the days after we returned home, he had us go through the exercises again. I felt secure and at ease with Hezi. He's experienced, patient, and leaves everyone with a sense of accomplishment. Even if you've never shot a gun before, you'll fit right in and will go home feeling accomplished and good about yourself. The perfect place to get an introduction to firearms. My sisters , girlfriend and I took a private group lesson with Hezi on handgun training. Hezi was great! He was patient, knowledgeable and fun to work with. The deal was fantastic , we got an hours worth of training and then went to the range for another hour where we each shot 180 rounds. The gun rental, bullets and range fees was all included in the package. This is the place to go if you want to learn the art of self defense. I surprised my fiancé with a private beginners class for his birthday and we had the most amazing time! Hezi is such knowledgeable and patient instructor. We both felt we were in the best hands and left the class feeling like badasses. Would highly recommend for anyone looking to learn how to adequately shoot and be safe at the same time ! I hadn't fired a gun in years and had never received any kind of professional handgun training , so I wanted to try the Israeli system. Hezi is an excellent instructor, who places a strong emphasis on safety first. All you have to do is show up and listen and Hezi will take it from there with his diligent instruction, careful correction and patience. Hezi creates a relaxed and enjoyable environment in which to learn. I look forward to continuing my education with the next Israeli Tactical Academy class and highly recommend it to anyone who is interested in learning how to shoot safely and effectively. I've done several shooting courses, and this is by far, the best one for learning practical self-defense shooting. Hezi is an excellent instructor and can make even the most inexperienced shooter safe and comfortable. Whether you are new, or experienced and interested in mastering Israeli style shooting, I highly recommend ITA and instructor Hezi. I heartily recommend the Israeli Tactical Academy for women. As a tiny woman who is afraid of guns (but who thinks it is important to understand how to disarm and use one in an emergency) I cannot recommend Hezi's private gun training program enough. He is calm, an impeccable teacher who walks you through everything you need to know, and is very patient as one works out their nerves. I highly recommend he create a program just for women and advertise it, so that more women like me and their friends are exposed to this important self-defense and safety topic. Great job and keep up the great training! Handling a firearm is very much out of my comfort zone. At least it was before attending Hezi's beginner shooting seminar. Education and safety are the hallmarks of these seminars. You will learn how to handle, load, and shoot a firearm with confidence and skill. Hezi has a ton of patience and will work with you in a way to make your experience super fun. He is highly skilled in teaching people how to use all types of weapons. You will not regret giving yourself the opportunity to learn how to shoot. 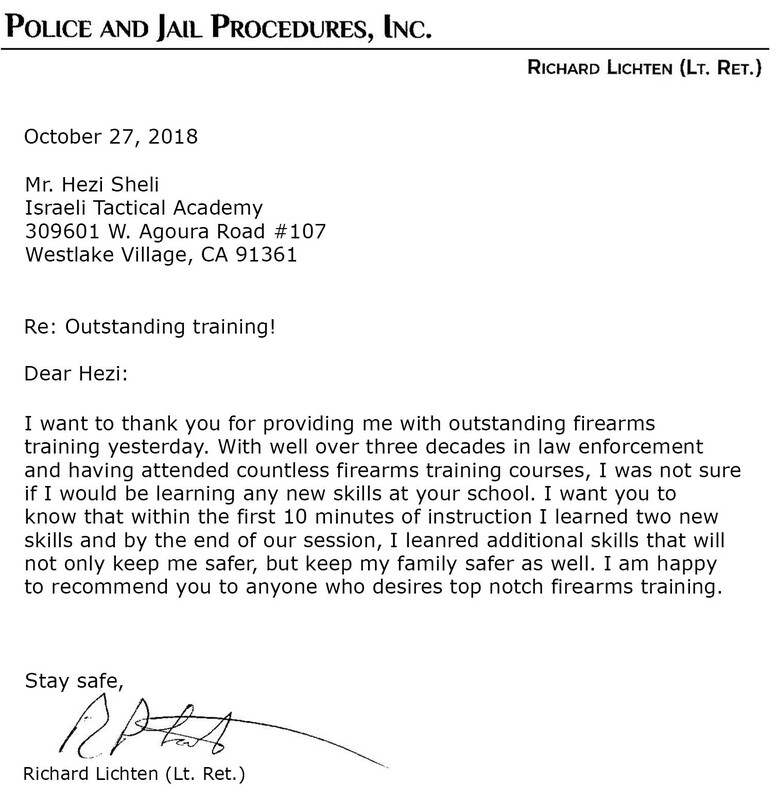 Since I have taken two of Hezi's seminars, I feel so much more confident in handling a firearm, and I look forward to continuing to take classes from the Israeli Tactical Academy. Took Hezi's beginner seminar this past weekend (6/12/16). As is the same with his martial arts academy - Hezi is a 1st-class professional with the absolute right balance of patience, discipline, education, fun, all wrapped in safety. I essentially have zero experience with firearms, how to load, how to handle, how aim, and every other aspect of a firearm. After yesterday, I feel so confident and experienced not only in all these aspects but also a tactical aspect which also was such a learning experience. I trust my entire family in the hands of Hezi and sincerely appreciate his expertise and attention to each individual student. Whether a beginner or expert marksman - Hezi's academy is the place to learn with safety. Can't wait to do it again. Israeli Tactical Academy shared a post. Sometimes a handgun is just not enough..
Firearms warm up drill - three mags of five rounds to a short distance (15 feet) target. A Judge Made So-Called "High Capacity" Magazines Legal in California for a Week. More than a Million Were Sold. For the first time in nearly two decades, the sale of "high capacity" magazines exceeding 10 rounds was allowed to be sold in Califonia after a federal judge temporarily threw out the state's ban. So from March 29th to April 5th, thousands of law-abiding gun owners flocked to the nearest gun shop. We are the most genuine Israeli Shooting Academy in Los Angeles and Ventura County, CA, specializing in all major aspects of Israeli Hand-to-Hand combat system.